140g transparent red vinyl. Heavy board, gloss-laminated outer sleeve. Black, poly-lined inners sleeves. Shrink-wrapped. ATIC Records is proud to present the long awaited album collaboration from one of the UK’s most celebrated underground producers, Aim (Cold Water Music, Hinterland, Flight 602), and master-blaster Long Island MC’s QNC aka Q-Ball & Curt Cazal (legendary producer of the JVC Force classic ‘Strong Island’). Three years in the making, ‘The Habit of a Lifetime (And How To Kick It)’, whilst comfortingly familiar in style to anyone fiending that early 90’s golden-era hip-hop flavour, is certifiably fresh. It features Aim’s finest, most inventive beat-scapes to date and vocally, Q-Ball and Curt Cazal are on fire with line after line of dope rhymes, topped with often hilarious punchlines and that syrupy flow that’s getting harder and harder to find. The album boasts a number of hand-picked, high profile ‘features’ including, B-Luv (JVC Force), Dimes, Niko, the great Grand Puba and the late Sean Price who sadly passed away earlier this year - a legend and true master of his craft. Of the ‘We Don’t Play’ session Curt Cazal recalls “he [Sean P] was the consummate professional. I played him the beat and he laced it in no time. He was quite a character and will be missed”. 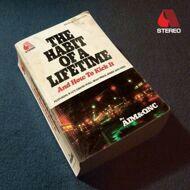 With ‘The Habit of a Lifetime (And How To Kick It)’, Aim & QNC have succeeded in creating a timeless masterpiece that not only sits where the underground and the mainstream meet, but one that achieves that seemingly long-forgotten goal of making hip-hop with real soul.